Electric pressure washers can be considered to be the second generation power washers. They don’t run on fuel neither are they hard to maintain. In fact, these are silent operators with sufficient power to work on most household chores. The only place where this kind of a power washer falters is when you need pressures upwards of 3000 PSI. For this the induction motor has to be brush-less and massive too. The biggest advantage of having an electric pressure washer (or power washer) is that it is lightweight, portable and pollution free. This means you can use it inside the house, wherever you like and even clean marble and tile flooring. Below you’ll find out 5 best electric pressure washers on the market in no particular order. When we were deciding on our top 5, we looked at size and weight, power, application, customer service and overall functionality. Pros: AR Blue Clean AR116 comes with a sleek ergonomic AR Blue Clean AR116 ​handle with trigger gun control to shut off power. The Karcher K3.540 is a dependable inexpensive pressure washer. This electric washer uses an induction motor with water cooling to deliver a cool 1800 PSI at 1.5 GPM with a direct drive axial pump. It is easy on the eye and simple to operate with very few problems. Plus, Karcher’s excellent service and customer support makes it a real treat having this as a backup pressure washer. Pros: Lightweight, efficient, simple to use and good backup tool. Cons: Plastic tips instead of metal spray heads, upright body. Usually an electric pressure washer is cheaper and easier to maintain but they lack the power required for basic household tasks. The AR Blue Clean AR383 however provides a nice 1900 PSI with plenty of power and configurations. This pressure washer is cute and easy to use with loads of applications. It is definitely something worth having around in the house if you aren’t interested in gas washers at all. Pros: Simple to use, light in weight, variety of attachments and high usability. Cons: The wand can at times tangle and is made from hard plastic. The hose adapter tends to sprout a leak. Now don’t go by the picture because it is a powerful pressure washer for its size. 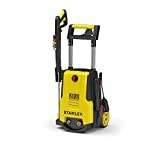 A compact pressure washer that can be carried by hand and that can generate 1,500 PSI is definitely not something to play around with. This little beauty has got exactly what is needed for domestic applications while being small enough for women too. No need to wait around for the man to do all the work, you too can jump in get things cleaned. Pros: Inexpensive, lightweight and ultra-portable. Great for women too! Cons: Can’t expect too much power, connections and construction is majorly plastic. Karcher usually makes some of the most trustworthy electric power tools. The K5.540 is no different as it features a state of the art water cooled induction motor that pelts out an impressive 2000 PSI at 1.4 GPM. Lightweight and compact in design, it is an ideal solution for any kind of cleaning task. Use hot water or fill the onboard tank with detergent to clean better. Pros: 2000 PSI, top of the class, easy and user friendly. Cons: Can easily fall on its face, plastic components, lack of longevity. There is a popular misconception that a pressure washer is actually a tool used by painters. The truth is that there are several jobs around the house that can be accomplished using a pressure washer. It is probably the best and easy-to-use tool to get rid of stubborn dust and dirt that is found on any surface. 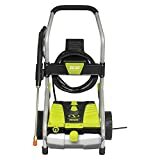 A pressure washer like the Sun Joe SPX3000 that produces a jet of water under high pressure and velocity is the perfect answer to removing stubborn dirt, and maintaining a clean home. Pros: Sturdy motor, suitable for heavy-duty cleaning tasks.Has extra long cord that provides extra maneuverability. Cons: The pressure washers are not leak proof and are susceptible to leaks. The hoses may have to be replaced frequently. You can’t have everything cheap but the Karcher K 2.350 attempts at giving you everything in a tight budget. 1600 PSI in under 14 pound of weight is no easy feat to achieve. Karcher has yet again brought about innovation in its long line of electric commercial pressure washers. This particular model replaces the older K320 from Karcher – just what you expect from German Engineering. Pros: Auto-shutoff, variable pressure, Good sized, simple use, basic pressure output necessary for household tasks. Cons: Shorter pressure hose and gun length, leaky hose connection. The AR Blue Clean AR142-P is a light, portable and user-friendly Cold Water Electric Pressure Washer that comes along with a Built-In Accessories Compartment, and handy additional accessories like an adjustable Spray Lance, a cleaning solution foaming bottle and an automatic start/stop control trigger with a safety lock. A high-powered, versatile and fuss-free cold washer that eases your weekly, fortnightly or monthly cleaning chores! Pros: Triple Power Pump, Adjustable Spray Head, Easy to Carry and Store. Cons: Low-capacity Foam Soap Dispenser, hence necessitating regular refilling. Powerworks delivers an impressive alternative to noisy gas powered beasts. 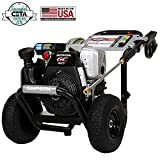 The Powerworks 51102 is a quite electric pressure washer that operates on an induction motor delivering 1700 PSI at 1.4 GPM, which is just about sufficient for basic household chores. 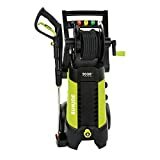 Best of all, this pressure washer is eco-friendly and can be used indoors. It is cute, sleek looking and easily misunderstood to be a vacuum cleaner. All its components easily store away on its body such as the wand, nozzles, attachments and spray tips. Pros: Light, easy to use, portable and noiseless. Cons: Not easy to winterize, slightly under-powered. Ultra affordable, just about dependable enough and good for less than average usage. 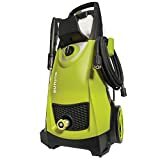 Basically the Karcher K 2.27 is a pressure washer that is designed for backup work, to stay indoors during winters and help around with a larger unit. It is an ultra-portable washer that can be carried anywhere and that produces enough pressure for most domestic applications. Pros: Good looking, compact design with very little weight and low cost. Cons: Cheap nylon and plastic components, unreliable motor. Induction motors are the most commonly used types in electric pressure washers. Because of the size and power output required the power output and design varies. Highly efficient and powerful induction motors cost a lot and can play a major factor in performance as well as costs. Electric motors are highly efficient and so the actual pressure and GPM of an electric pressure washer depends on the design of the pump. Triple axial pumps are always a better option although they are not usually found on low end models. To decrease weight, many manufacturers tend to incorporate plastic into the construction. Plastic is not really a bad choice as long as it is limited only to the casing and outer construction. The connections and important components should all be in metal as plastic has poor reliability. With a gas washer, the hose reach is not an issue but with electric washers, you need a longer hose reach as your washer can only move as far as the power cord allows it to. Make sure that the pressure washer provides safety features against shocks, accidental twisting of wires and auto-shutoff.